When oxygen is inhaled into the lungs, it attaches to hemoglobin (a protein in red blood cells). The red blood cells then transport oxygen into the bloodstream, allowing it to be dispersed to tissue. Most of us need about 550 liters of oxygen per day to function, but that volume can double or triple during exercise. As you train, your body will be able to utilize more oxygen, more efficiently. To find out how much oxygen is in your blood, a pulse oximeter emits light (typically red and infrared) through one side of your finger onto a photodetector on the other side. As it passes through your finger, the light hits your blood cells, and is absorbed differently by the hemoglobin without oxygen (deoxyhemoglobin) than by the hemoglobin with oxygen (oxyhemoglobin). The quality of the light that makes it to the photodetector can tell us how much oxygen is in your blood—normal ranges are typically from 94 percent to 100 percent. Different oximeters are made for different purposes. Some are designed just for use in hospitals, but others can be more useful for athletic performance. The Masimo MightySat in particular offers four other metrics in addition to the standard blood oxygen saturation (SpO2). With heart rate (HR), respiration rate (RR), Perfusion Index (PI), and Pleth Variability Index (PVI), you can keep detailed tabs on your training progression, all of which can be synced to TrainingPeaks. At altitude, where the air is thinner, it is more difficult for your body to get adequate oxygen to your muscles and tissues. 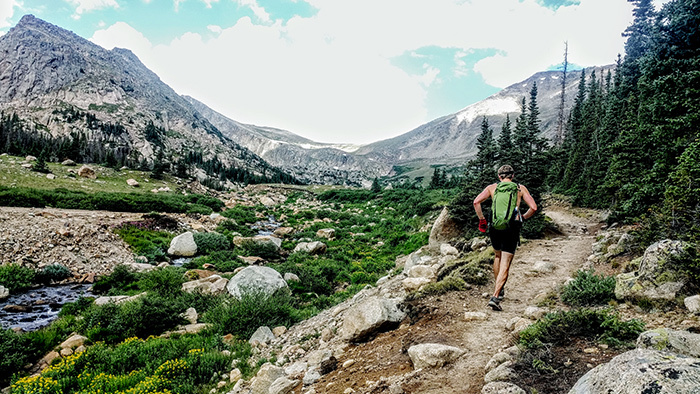 For example, if you’re racing or training at 10,000 feet (3000 m), the amount of effective oxygen in the air is about 15 percent (compared to 21 percent at sea level). If you’re used to living at sea level, this change in oxygen availability will kick off a cascade of physiological adaptations, some of which are advantageous no matter where you’re racing. To start, there will be an increase in your respiratory and heart rates; and the volume of blood ejected from the heart (stroke volume) will be reduced. Over your first 24-48 hours at altitude, blood plasma volume will also be reduced to improve the oxygen-carrying capacity of your blood by volume. These adaptations won’t necessarily feel good—in fact you’ll probably feel like you’re doing more work for less reward. However, prolonged exposure to altitude will cause your body to increase production of red blood cells with larger hemoglobin, allowing for a partial or full restoration of the blood volume and arterial oxygen content. After four weeks or more, your maximal heart rate response will be lower, as will your peak cardiac output—your blood is carrying more oxygen, so your heart won’t need to pump as fast or hard. Once fully acclimatized, your peak oxygen uptake will be the same as at sea level, but the saturation of arterial oxygen will be increased i.e. you will have more complete oxygenation of the blood in the lungs. That means you’ll be able to race and train as normal at altitude, and will likely enjoy some extra aerobic endurance at sea level. The Respiratory Rate (RR) function lets you gauge recovery after higher intensity workouts. For example, if you know the time it takes your RR to come back to baseline after performing a 5 minute interval at sea level, you will see that your RR takes longer to recover at altitude. As you acclimate, you should see the time for recovery drift back towards your baseline. Whether you use a pulse oximeter for altitude training or just monitoring your recovery status, it is a simple and easy to-use tool that can give you some really valuable insights.